Home Summit Presenters 2016 Bill Hammond, Ph.D.
Bill Hammond, Ph.D. served as assistant professor of ecological and marine sciences at FGCU. He is mostly recognized for his exemplary support of nature study, environmental and experiential education focusing on best practices of managing environmental resources. Hammond has been an educator in Southwest Florida for five decades. He earned a BS, MS, EdS and PhD at Simon Fraser University in British Columbia. He has been recognized with awards such as the President George Bush, Sr. and Congressional Theodore Roosevelt Award for conservation service to the nation and Urban Land Institutes Pathfinder Award in SW Florida 2001. He has conducted presentations, training workshops and consultations in 50 states and five Canadian Provinces, England, Soviet Union, Republic of Georgia, and 19 Caribbean nations for a wide range of educational, government, business, professional, and non-profit clients. He is the recipient of the 2002 Southwest Florida Horizon Council Outstanding Achievement for SMART Growth award. 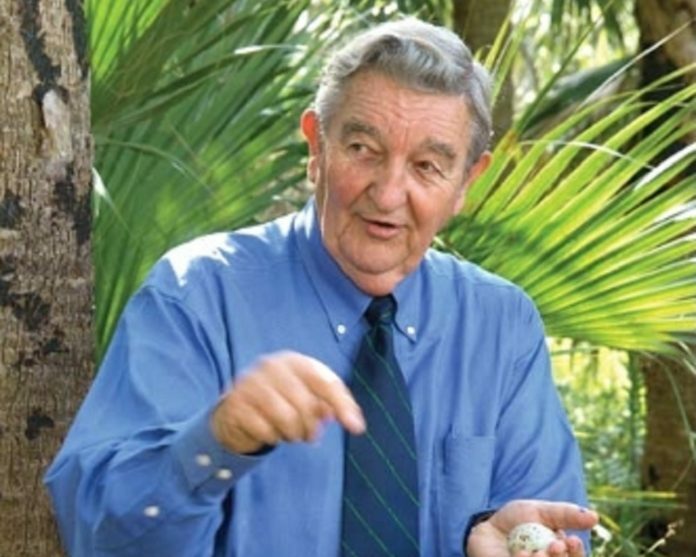 He was honored by Gulfshore Life magazine in “Environmental Heroes in Southwest Florida” in 2003, and was awarded the 2004 McTarnaghan Outstanding Teaching Award at FGCU. Bill Hammond, Ph.D. is President Natural Context Consultants, Professor Emeritus Florida Gulf Coast University (retired), and a resident of Lee County Florida 54 years. Educator for the past 55 years, Lee County Schools 33.5 yrs. Teacher/Director Curriculum-EE/Sci, Moravia N.Y. 2 years, B.S. M.S. SUNY Cortland/ Cornell, ED.S. USF, Ph.D. Simon Fraser University British Columbia. Founding Faculty FGCU retired Professor Emeritus Ecology & Marine Sciences, 23 years Summer Session Professor Simon Frazer University Summer Graduate Environmental Education Institutes, Royal Roads University Masters Environmental Education & Communications Summers, Session Instructor NSF – FAU, FSU, USF, and Edison CC., awarded 7 National Science Foundation Graduate Fellowships at University of Rhode Island, Bowdoin College, UF, USF, FSU, Thiel college, Lamar Tech. College. Instructor – General Electric Applied Creative Thinking Residential Program (Fortune 50 Companies 8 yrs. upper management leaders). Consultant. Keynote Speaker & Workshop Presenter & Facilitator work (Applied Creative Thinking – Business & Education Contexts, Ecological Thinking & Planning, Environmental/Sustainable Systems Planning, Applications of Brain Science to Learning, Nature and Health Connections Research) in all 50 States, 9 Canadian Provinces and 18 foreign counties. Served as a National founding member of Project Wild, Project Learning Tree, Human Habitat Project, President of the National Alliance for Environmental Education, Life member NAAEE, VP American Nature Study Society, National Conservation Education Association and Consultant to Federal, State and regional government agencies and not-for-profits EE, environmental planning, communications, and creative problem solving. Founding Trustee of the National Brandwein Institute, Founding Brandwein Fellow. National Paul F-Brandwein Institute inaugural Brandwein Lecturer NSTA National Convention. Bill Hammond, Ph.D. founded and taught the Internationally recognized Lee District Schools Environmental Education Program and the “Monday Leadership Group” for H. S. 11 & 12th Grade students who lead the successful Campaign to acquire the Six Mile Cypress Slough feeding freshwater to Estero Bay, Manatee Park and many other projects in the last 35 years. Served two terms on Lee County’s first Lee County Commission appointed Planning Commission (2 terms), Co-chaired the Lee County Smart Growth Horizon Council and Lee County Committees and founding member of Conservation 4 terms on County Six Mile Basin Board , City of Ft. Myers Brown Fields Advisory Committee and Lee 2020 Citizens Advisory Committee (Founding to last year) and served multiple terms as President of the CREW Land & Water TRUST. Currently serves, as a Special Consultant to Kitson & Partners on all environmental and sustainable planning and education initiatives in Babcock Ranch Community (since its inception), is President of the Calusa Nature Center & Planetarium Board of Trustees – founding Exec. Director. Special Advisor to the National Association of Nature Center Administrators. More than 75 published Professional articles, book chapters and books related to education curriculum and strategies, dynamics, considerations and tools for planning sustainable ecological planned projects and communities. Florida League of Environmental Education, Career Golden Leaf Award. FGCU Professor of Year. (Student voted).